The panel on Women in Leadership featured (from left) Billie Jean King, moderator Lynn Sherr, Ellen Ochoa and Condoleezza Rice. She was the first American woman in space. But Sally Ride was also a physicist, an author, an athlete and a crusader for equity in education. So it’s fitting that the celebration of a U.S. 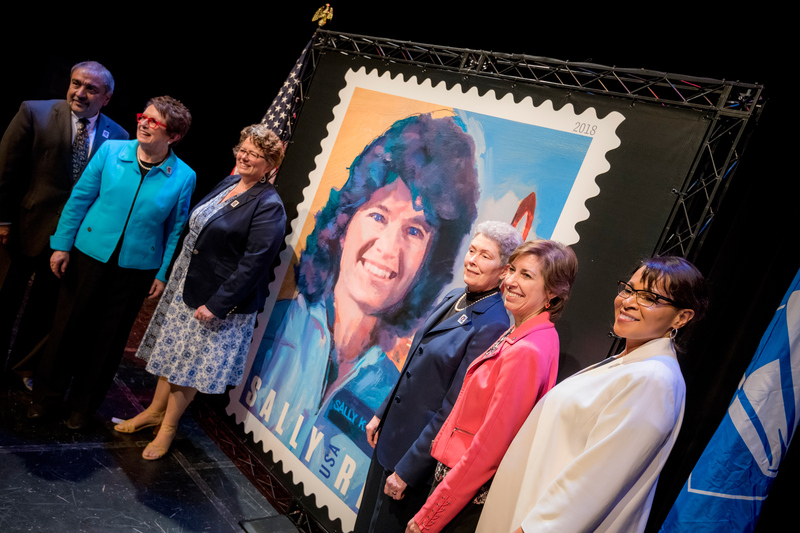 Postal Service stamp honoring Ride featured wide-ranging tributes and a freewheeling panel discussion among women leaders in a variety of fields. The U.S. Postal Service dedicated the Forever stamp in a ceremony at UC San Diego’s Price Center May 23. Speakers including tennis legend Billie Jean King and astronaut Ellen Ochoa remembered Ride as a caring friend, a dedicated scientist and a role model who continues to inspire young people around the world. Following the ceremony, Sally Ride Science and UC San Diego hosted a candid and lively discussion on Women in Leadership featuring King, Ochoa and 66th U.S. Secretary of State Condoleezza Rice. Journalist Lynn Sherr, author of a Ride biography, served as moderator. All four women were good friends of Ride in addition to being pioneers in their fields. Sally Ride’s mother, Joyce, watched the stamp dedication. About 480 people turned out for the stamp ceremony, which was free and open to the public. (Watch a video of the ceremony here.) Guests were able to purchase Sally Ride stamps and souvenirs such as first day “covers,” post-marked stamps with the late astronaut’s signature. Around 800 invited guests attended the leadership discussion. During the stamp dedication ceremony, Tam O’Shaughnessy, Ride’s life partner and executive director of Sally Ride Science, recounted how Ride began collecting stamps on a family trip to Europe when she was 9 and pursued the hobby for the rest of her life. After Ride made her historic space flight in 1983, she was delighted when countries such as Mali and Guyana issued stamps with her picture. “But a United States postage stamp? She would be thrilled beyond belief and just deeply honored,” O’Shaughnessy said, as Ride’s 94-year-old mother, Joyce, and sister, Bear, looked on proudly. O’Shaughnessy chose UC San Diego to host the celebration because of Ride’s long association with the university. Ride was a physics professor at the school before joining with O’Shaughnessy and three friends to found Sally Ride Science in 2001. Their goal was to inspire girls and boys of all backgrounds to study science and to imagine themselves in science and technology careers. Sally Ride Science became part of UC San Diego in 2015 under the direction of UC San Diego Extension. UC San Diego was well represented at the celebration. Chancellor Pradeep K. Khosla, Executive Vice Chancellor for Academic Affairs Elizabeth H. Simmons and Vice Chancellor for Equity, Diversity and Inclusion Becky Pettit all spoke during the events. One of the most poignant moments of the stamp ceremony came during remarks by Ochoa, who was the first Hispanic woman in space and later director of NASA’s Johnson Space Center. After Ride’s death from pancreatic cancer in 2012, a number of women astronauts gathered to dedicate a memorial tree at Johnson Space Center. “As we went around the table, just about every single woman in the astronaut office, current and former, had been personally affected by Sally,” Ochoa recalled. The Women in Leadership discussion touched on a wide range of themes, from the challenges of being the first in a field to the importance of mentors and the life lessons we can learn from sports and music. The panelists shared personal stories of their triumphs and setbacks as pioneering woman leaders. When Sherr asked about role models who inspired the women, they all pointed to their parents. Rice, the first African American woman to serve as secretary of state, talked about growing up in segregated Alabama. Her parents, both educators, impressed upon her that she could achieve anything she set her mind to. “My parents had me believing that I couldn’t have a hamburger at Woolworths’ lunch counter but I could be president of the United States,” she said, eliciting a laugh from the audience. Sherr also asked the panelists to share lessons they learned from different fields. King, a high-profile champion of women in sports and human rights, noted that taking part in sports helps prepare young women to become leaders in other fields. Rice, an avid sports fan who often watched football games with Ride, agreed that sports can teach crucial lessons. “Sports has taught me that sometimes you work as hard as you can and it doesn’t work out . . . but you still have to get up the next day and you have to keep going,” she said. Ochoa, known for playing the flute in space, said that being in musical ensembles taught her lessons that stayed with her as she became an astronaut. “The way you approach that is the same as being a crewmember on a flight,” she said, noting that in both settings, you have to know your own role but coordinate with others to achieve success. The panelists drew from their life experiences to offer advice to the young people in the audience. They all stressed the value of finding mentors and of being a mentor to others. “A lot of leadership is championing others,” King observed. Ochoa talked about the importance of reaching out to young girls to encourage their interest in science and technical fields before they drift away from these subjects. “You have to talk to girls no later than middle school,” she said. “Girls make choices early that sort of knock them out” of pursuing STEM studies and careers. In remarks before the panel discussion, Vice Chancellor Simmons, a physicist, spoke of the need for diverse role models. She noted that for her generation of physicists, Ride was one of the few female role models. “It’s crucial that we keep Sally Ride’s story and her legacy visible for future generations,” Simmons said. Chancellor Khosla spoke during both the stamp ceremony and the panel discussion. At the stamp event, he pointed to the synergy between UC San Diego and Sally Ride Science. The Women in Leadership panel was made possible in part by support from Red Door Interactive, Thermo Fisher Scientific and The San Diego Foundation. The panel discussion will be available on UCSD-TV beginning on June 4.